Phoenix — A conductor’s widow accused Berkshire Hathaway Inc.-owned freight rail giant BNSF Railway of being responsible for a train hitting and killing her husband while he performed maintenance work at night, according to arguments made in a wrongful death trial currently underway in Arizona state court. Jurors began hearing arguments on April 21 in the wrongful death suit filed by Tina Wilcox on behalf of her husband Michael, who died in 2009. Wilcox’s suit, brought under the Federal Employers’ Liability Act, claims that BNSF stopped the train on which Wilcox was working in an unsafe location and failed to provide him with high-visibility reflective gear. Wilcox was attempting to release hand brakes alongside a train that had stopped in Holbrook, Arizona for a crew change, when he was hit by an oncoming train. 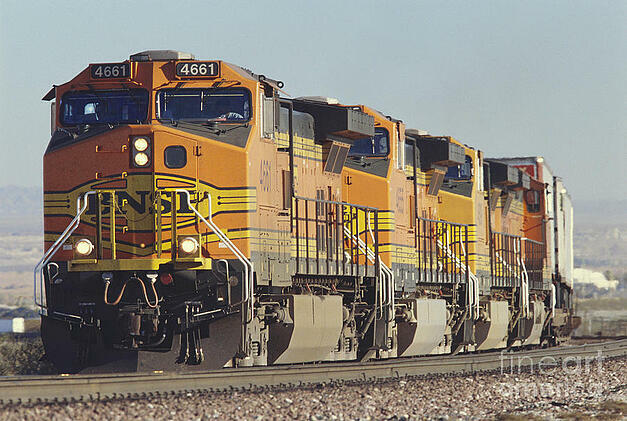 He died approximately two hours after being struck, and Tina Wilcox sued BNSF two years later in 2011. In addition to allegations that BNSF positioned Wilcox’s train in a dangerous location, the suit also accuses the company’s dispatchers of failing to alert the crew of the oncoming train about the need to reduce speed, and claims that the oncoming train didn’t provide necessary horn warnings. “BNSF knew that an eastbound train was approaching the location where Mr. Wilcox was working on the adjoining mainline track, but neither directed the eastbound train to stop nor Mr. Wilcox's crew to stop work until said train had passed,” Wilcox’s complaint states. During his opening statement, Wilcox’s attorney Anthony S. Petru of the California-based firm Hildebrand McLeod & Nelson didn’t name a specific amount of damages that he planned to ask for during the trial, but he suggested to the jury that Wilcox, who regained consciousness following the accident, suffered tremendously during the two hours from when he was struck until he died after being airlifted to a Flagstaff hospital. During his opening statement on behalf of BNSF, Bradley Shwer of Thorpe Shwer PC told jurors that the company acted properly, and that Wilcox’s own actions led to the accident. Shwer told the jury the train that hit Wilcox was traveling at a reduced speed and would have been easily visible to an “attentive observer.” He claimed witness testimony would show that Wilcox was speaking on his cellular phone just before the oncoming train struck him, and that Wilcox only needed to take a single step to have safely avoided a collision. In addition to suing under FELA, Wilcox’s suit also includes claims under Arizona state law. Although FELA was passed by Congress in 1908 to compensate injured railway workers, both state and federal courts have concurrent jurisdiction under the act. A similar trial last month in Georgia state court resulted in a $1 million verdict against Norfolk Southern Railway Co. in a suit brought by a company employee who was struck by a low-speed train while riding in a van in a railyard. That case was also brought under FELA in addition to Georgia state law. The Arizona trial before Judge Randall Warner is expected to take nearly a full month to complete, and gavel-to-gavel video of the proceedings is available via Courtroom View Network. Attorneys for the plaintiffs and a representative for BNSF did not respond to requests for comment. The plaintiff is represented by Anthony S. Petru and Kristoffer S. Mayfield of Hildebrand McLeod & Nelson LLP and by Jason J. Romero and Don Andrew St. John of St. John & Romero PLLC. BNSF is represented by William L. Thorpe and Bradley D. Shwer of Thorpe Shwer PC. The case is Tina Wilcox v. BNSF Railway Co., case number CV2011-000477, in the Superior Court of the State of Arizona for Maricopa County.